Located about 36 km North of Thiruvananthapuram, near the famed beach of Varkala, and lying on the seacoast is Anjengo or Anjuthengu, meaning five coconut trees. A place of historic importance as well as beautiful natural setting, Anjengo is an ideal destination for those who don’t mind walking around and explore what is in store. The historic significance tagged to Anjengo comes through foreign powers like the Portuguese, the Dutch and finally the English East India Company. In the year 1684, the English East India Company chose Anjengo to establish their first trade settlement in Kerala. Following the English East India Company’s presence, the place came to be known as Anjengo, meaning five coconut trees. According to local folk, the name Anjengo owes its genesis to a small area of land with five coconut trees, which was given on lease to the English East India Company by the then Queen of Attingal for trade purposes. 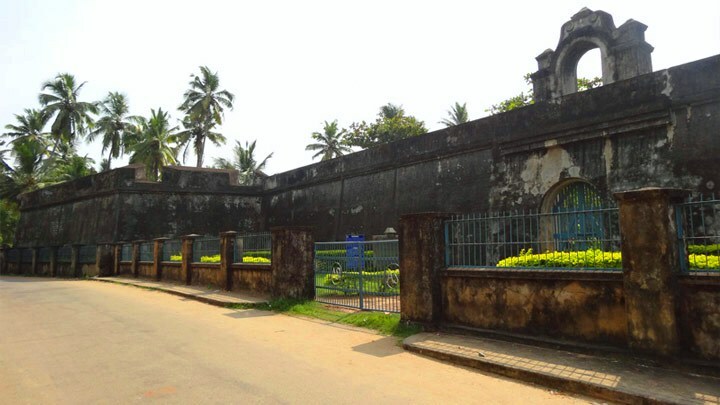 At Anjengo, one can find the remnants of the old English Fort, which was targeted several times by other foreign powers, who were at that time fighting each other to get a firm footing in Kerala. The Fort is now under the protection of National Heritage Monuments. There is also a cemetery inside the fort, which most probably would be having the remains of the occupants of the fort, and the oldest among the burial sites dates to 1704. The backwater stretch here at Anjengo, and the avenue of coconut trees that crisscross the water channels are indeed a sight to behold. Another attraction at Anjengo is the serene beach, which is very clean and ideal for picnickers. The fishing village adjoining the beach adds to the overall charm of Anjengo, with the fishermen and their routine activities adding to one’s interest.